Hiking up Redcliff, with Wetterhorn Peak in the background - June. 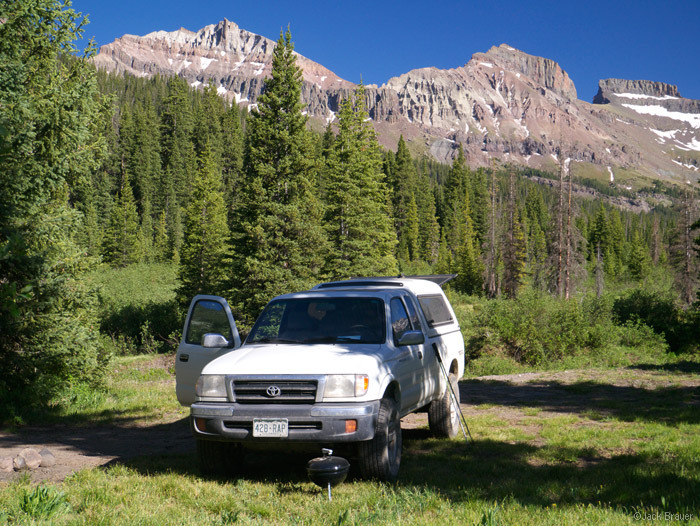 With clear blue skies and dry weather, we spent the weekend car camping and peak bagging in and around the West Fork of the Cimarrons, on the northern end of the San Juan Mountains in southwest Colorado. 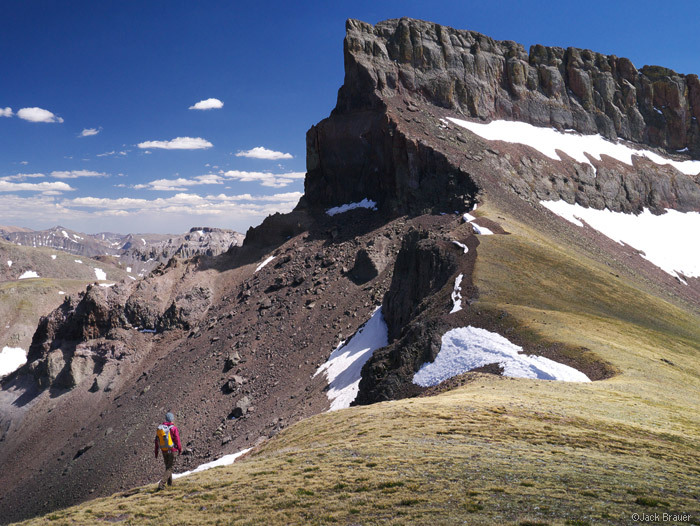 Towering over the West Fork valley are a number of rugged mountains, including the thirteeners Redcliff and Precipice Peak. 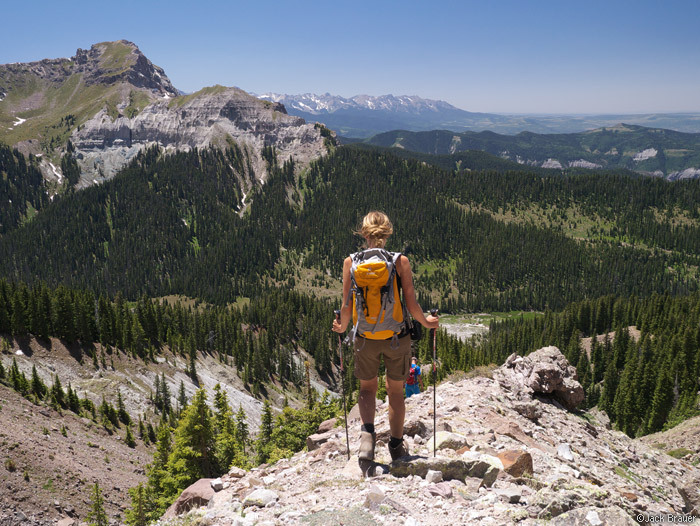 I’ve passed these two peaks many times during backpacking treks in the Uncompahgre Wilderness and always wondered what it would be like to hike up them. This weekend would be a good opportunity to find out! Our car camping spot in the West Fork. Not too shabby! Relaxing and sleeping in was the name of the game this weekend. No early morning or late night photography missions – just good old fashioned day hikes. Our first day’s destination was Redcliff, the 13,642 ft. mountain visible above and to the right of the truck in the photo above. At the very far right is Coxcomb Peak – we would hike to the saddle between the two, then head up the ridge to the summit of Redcliff (not as crazy as it looks from this perspective). 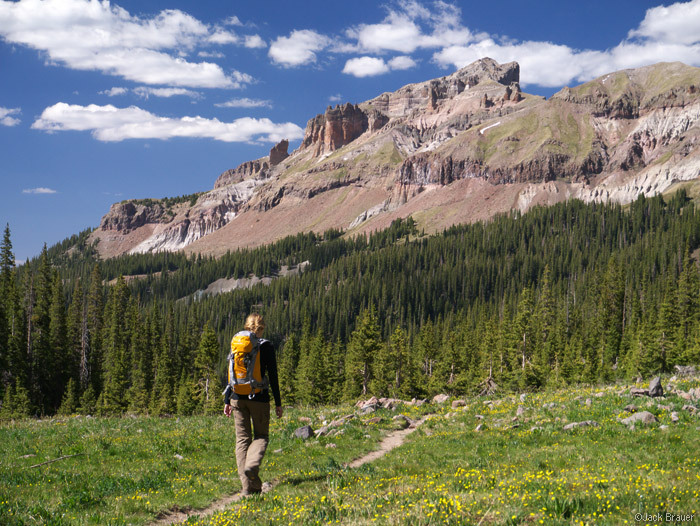 Hiking up and out of the West Fork basin. 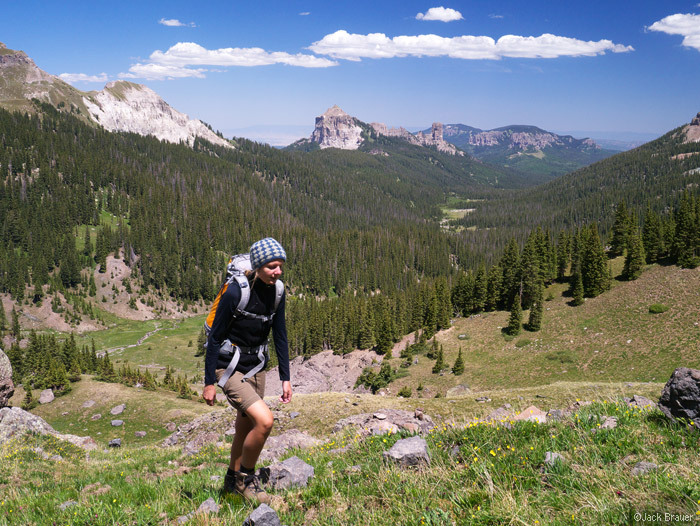 We followed the Wetterhorn Basin trail until just after the first switchbacks in the open basin, then left the trail and followed the creek drainage up to the saddle between Redcliff and Coxcomb. Pretty obvious route finding. The first photo above shows Claudia hiking up Redcliff’s ridge, with an awesome view of Wetterhorn Peak behind. Here she is on the 13,642 ft. summit of Redcliff! With no thunder danger whatsoever, we lounged up there for a couple hours before heading back down. Hiking down with Coxcomb Peak looming overhead. 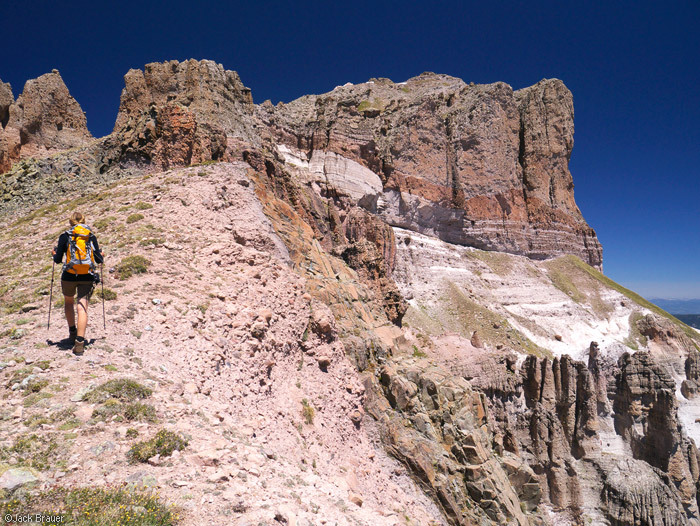 At 13,656 ft., Coxcomb is just slightly higher than Redcliff, though obviously more challenging to ascend! Hiking back to our camp, looking at Precipice Peak, our goal for the following morning. Back at camp that evening, we were pleasantly surprised when our friends Parker and Aimee showed up out of the blue! The route up Precipice Peak. Click image to view larger. 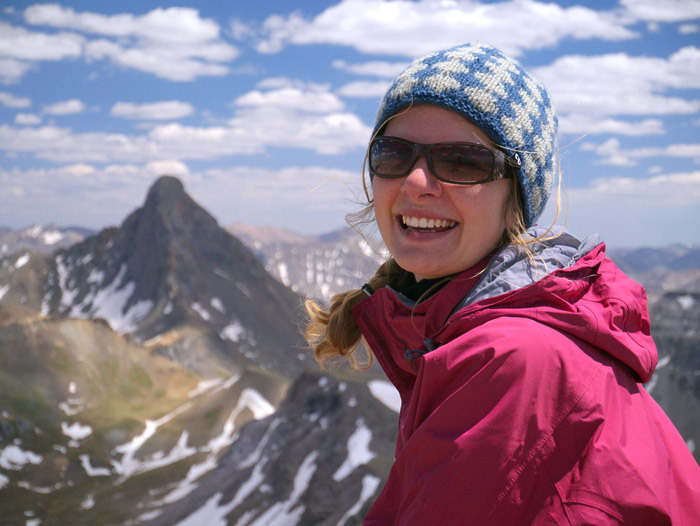 Precipice Peak is an obscure and relatively seldom climbed peak. As seen from the town of Ridgway, Precipice forms a dominant “shark fin” profile that is one of the highest visible points in the Cimarrons. 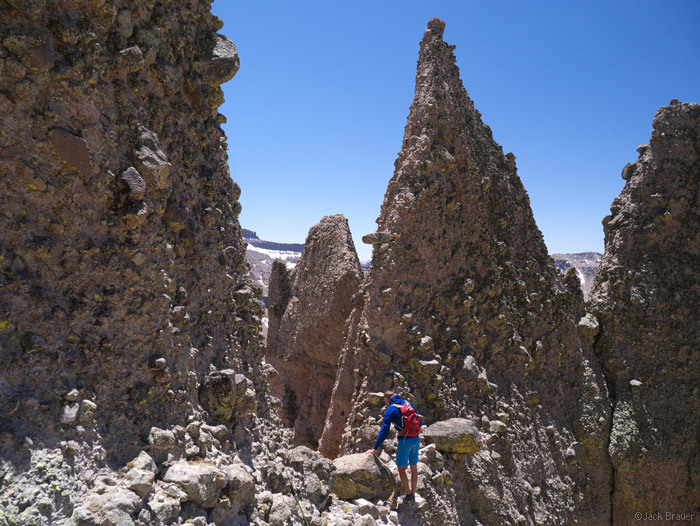 As seen from the east, in the Middle Fork of the Cimarrons, Precipice is a jagged forbidding peak, with hundreds of enormous hoodoo formations and a past-vertical sheer summit block. 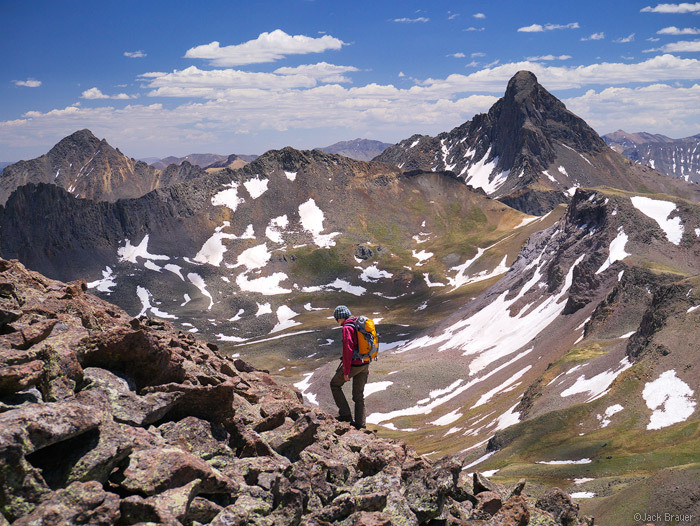 The west side of the peak, from the West Fork valley, is clearly the standard way to climb this peak. 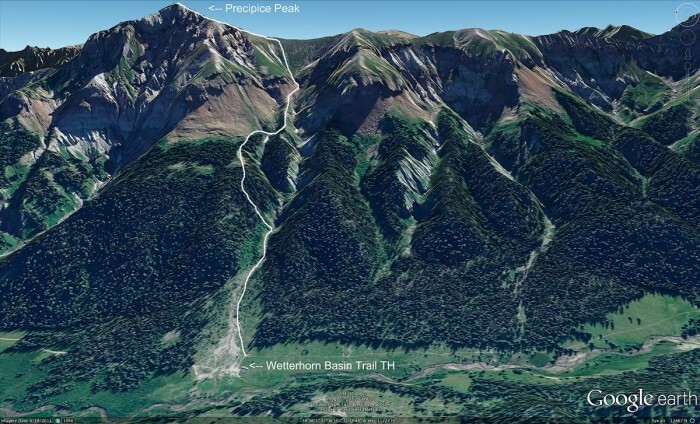 Above is a Google Earth snapshot of the west side of Precipice Peak, with the route we took roughly marked. (This was one of those hikes where a Google Earth printout was much more useful than the topo map). I believe this was more or less the standard route, and was not as difficult as I imagined it could be. We parked at the Wetterhorn Basin trailhead, and headed straight up the gully towards Precipice. Once the gully became too tight to proceed, we bushwhacked up through the steep forest until gaining the ridge. That steep forest bushwhack was the hardest part of the climb, and once we reached the forest ridge the going got easy. (Perhaps it would be easier to enter the forest earlier to gain that ridge earlier???) Anyhow, once we reached treeline, we traversed over to the little middle ridgeline, and from there the route is straightforward – just right up the gut and then up the broad tundra slope to the saddle. Hiking up the top ridge, with the summit cliff on the right. The hike was really fun up this ridgeline, with massive drop-offs to the east, and surreal rock hoodoos and toadstools everywhere. At one point it looked like all progress was blocked, but the route goes through a massive notch, visible above Claudia in the photo. Arriving at the 13,144 ft. summit of Precipice Peak, with a fine view of Wetterhorn Peak and Redcliff behind. Parker climbing back through the big notch on the way down. 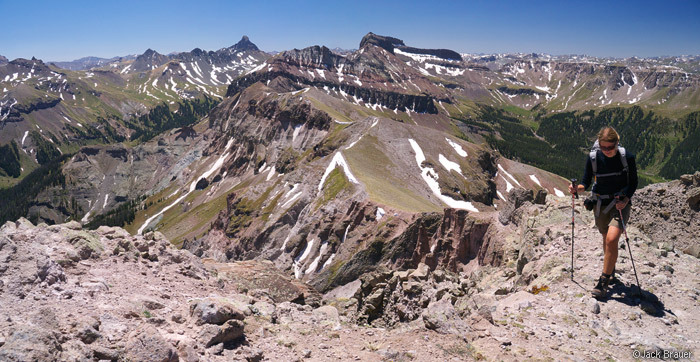 Hiking back down Precipice, with Peak 12725 on the left, and a bit of the Sneffels Range on the horizon. 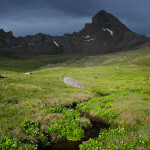 Posted in Colorado and tagged Colorado, San Juans on June 19, 2012 May 19, 2013 by Jack Brauer. Always exciting to get an update in mail from your blog. As a life long flatlander I feel like a little kid anytime I get near the Rockies. I’ve visited many times and never tire of seeing them. I enjoy your trips as much or more than you do. Keep hiking! Thanks Jim, I’m glad you enjoy my trip reports!!! Beautiful photos, Jack. Wish I were over there right now. Watch out for that infamous San Juans lightning. I’ve seen people’s hair standing on end and heard it humming over there more than once. Yikes. And, no worries about lightning lately… just nothing but dry blue skies. WE NEED RAIN! Spectacular. Roughly how much of an ascent was that ? Hi Ken, Redcliff was about 2800 vertical feet or so, and Precipice was 2300 vert. Amazing pics and report as always! Gorgeous. Thanks Arild, I’m glad you enjoyed it! Hey Forrest! Yeah I love the view of Precipice from the Middle Fork – such a gnarly peak as seen from that side. Numerous times I’ve gazed up there wanting to see all those hoodoos from a higher angle. Lovely photos. I went up Courthouse Mountain and Redcliff on August 10, 2012. You photos are a bit more dramatic though. I am anxious to go back and try Precipice Peak. In your estimation is there anything on the Precipice Peak route precluding a dog from making the summit? Hi Jon, that’s a tough question… there is one part along the ridge where you have to do a small scramble through a notch (you can see it in the second-to-last photo, though that doesn’t really show how steep it is). You’d maybe have to help/carry the dog over that part. And the whole thing is steep on fairly rough terrain so the dog should be in good hiking shape! Probably it’s doable though.